Party and State agencies, organizations as well as teachers and parents need to provide children with a better environment for entertainment and study, and encourage them to participate in social activities. 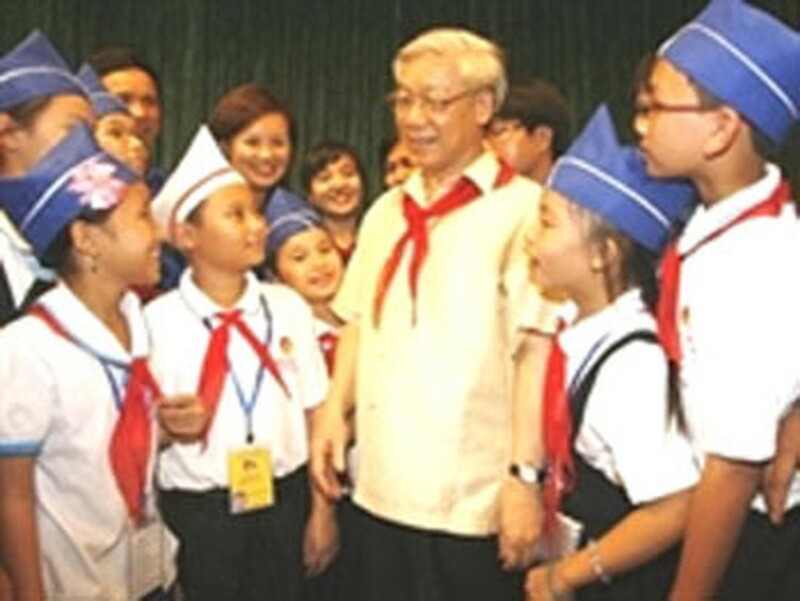 Chairman of the National Assembly Nguyen Phu Trong speaks to children at the 7th National Congress of Uncle Ho’s Good Children, held at the Vietnam-Russia Cultural Friendship Palace on July 18. Chairman of the National Assembly Nguyen Phu Trong made the suggestion at the 7th National Congress of Uncle Ho’s Good Children, held at the Vietnam-Russia Cultural Friendship Palace on July 18. Addressing the Congress, he praised young representatives for their outstanding achievements in study and carrying out social tasks assigned to them. He said for children to realize their dreams and ambition and become masters of the country, Party and State agencies and organizations as well as teachers and parents need to continue to enhance their sense of responsibility and cooperate together to protect, take care and educate them. Relative agencies need to build facilities for study and entertainment such as schools and children’s houses, he added. The NA Chairman said it is important to build up the Ho Chi Minh Young Pioneer Organization, especially in remote and disadvantaged areas, to create equal and comprehensive developmental opportunities for children. Of the 400 children representatives, 10 received badges and laurel wreaths from the NA Chairman and of Head of the Party Central Committee’s Commission for their Mass Mobilization efforts.